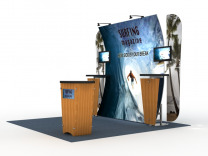 The use of dye sublimation graphics combined with the large radius extrusions will make the Magellan Displays the stand out booth in any lineup of trade show exhibits at any show. With Magellan, you can ask for and get much less from you new hybrid trade show booth. By less we mean that the Magellan Trade Show Displays cost less, is lighter weight, and will on average, set up in much less time than any competitor. All Magellan Modular Displays are created from MODUL extrusions with fabulous curved pieces and large dye sublimation graphics for a look that will bring envy to your competitors on the show floor. The Magellan can be purchased in 10 and 20 foot increments. Accessories for the Magellan include portable workstations, monitor mounts, halogen lights, and pedestals. Now big time success on the show floor can be portable and fun at the same time. Take a look at the huge lineup of exciting designs in the Magellan Displays section of Custom Modular Hybrid Displays from ShopForExhibits.com, or look on design search to see hundreds of great displays. 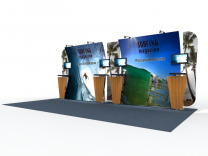 ShopForExhibits, a nationwide marketer of trade show displays, is expanding their internet product offering with display booths in the rapidly expanding tension fabric displays category. In order to support the business increase which they forecast for the future, SFE has recently gone live with a new web site that gives an enhanced level of client support in the way of video demos and enhanced product support. Many challenges lie ahead for retailers in this fast paced industry, which is often faced with reacting to a variety of business downturns, due to the uncertain business climate. Not every business is able to successfully bring new products such as tension fabric displays, to market via the internet, but ShopForExhibits has positioned themselves in a positive way through their industry and product experience, and on line communication skills, to have the best results in this most competitive industry. Having the ability to adapt to a changing market in the trade show exhibit industry is the sign of a great supplier, which is what Classic Exhibits has been so creatively able to accomplish. What did Classic see that gave them the initiative to forge ahead during bad economic times to create new marketable products? Classic noticed that they had several shapes of aluminum extrusions that that they already purchased that gave them an exceptionally large amount of linear footage per dollar when compared to others. As Classic moved forward based on good gut level instincts and some careful planning, they've been able to bring to market a whole series of successful displays that have as a group injected new life into the custom modular hybrid displays market. Classic developed and patented the Perfect 10 custom modular hybrid display system, plus the Sacagawea and Magellan Miracle tension fabric displays. As a result of all the great new trade show exhibit offerings that Classic has available, it’s no wonder that Classic maintains a leadership position in the market with their distributor network, and appears not to be slowing down one bit as they march into the future!